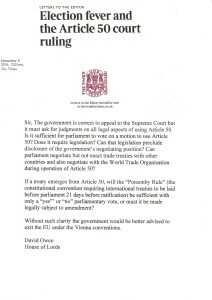 Sir, The government is correct to appeal to the Supreme Court but it must ask for judgements on all legal aspects of using Article 50. Is it sufficient for parliament to vote on a motion to use Article 50? Does it require legislation? Can that legislation preclude disclosure of the government’s negotiating position? 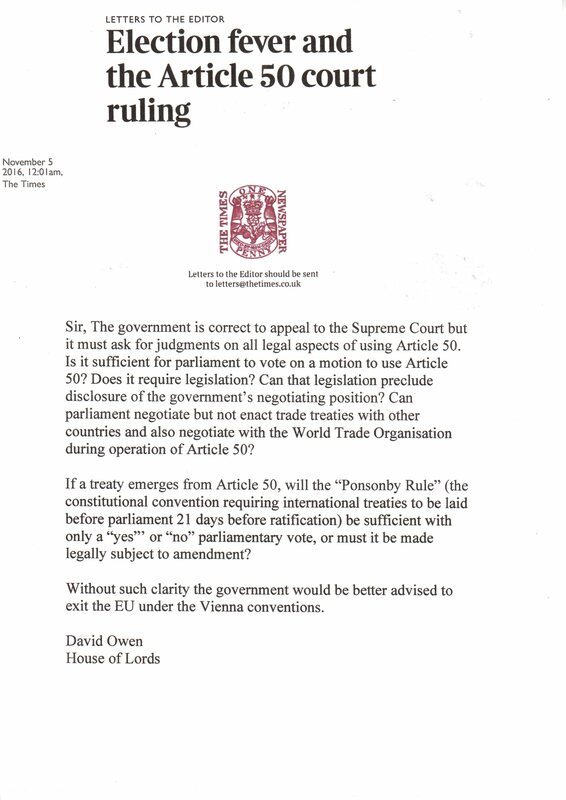 Can parliament negotiate but not enact treaties with other countries and also negotiate with the World Trade Organisation during operation of Article 50? If a treaty emerges from Article 50, will the “Ponsonby Rule” (the constitutional convention requiring international treaties to be laid before parliament 21 days before ratification) be sufficient with only a “yes” or “no” parliamentary vote, or must it be made legally subject to amendment? Without such clarity the government would be better advised to exit the EU under the Vienna convention.